Filippino Lippi was the son of the painter Fra Filippo Lippi, who was undoubtedly the boy's first master. After his father died in 1469, he became a pupil of Botticelli, who had a profound influence on his style. In fact, the Washington portrait comes so close to Botticelli's style that there has been considerable disagreement among scholars as to exactly which artist was responsible for it. Although it has been attributed more often to Botticelli than to Filippino, most recent authors are now agreed that it is by the younger painter. In 1483 or 1484, Filippino was assigned the task of finishing Masaccio's great frescoes in the Brancacci Chapel in Florence. This portrait bears a great resemblance to a young man portrayed there by Filippino. During the Gothic era and early Renaissance, donors of a painting would often be portrayed as tiny figures praying at the lower edge of a painting, as in Crivelli's Madonna Enthroned with Donor. During the Renaissance a new interest in the individual, in human character and feeling, gave rise to the genre of portraiture as an artistic expression. Filippino's likeness of an unknown sitter shows a young man dressed in the typically plain costume of a well-to-do Florentine of the time. (Stefano Bardini [1836-1922], Florence), in the later 1880s; sold 1890 to Prince Johann II of Liechtenstein [1840-1929], Vienna; (M. Knoedler & Co., New York and London), c. 1920; Mr. and Mrs. Frank D. Stout, Chicago, by 1924; consigned November 1930 by Mrs. Stout to (M. Knoedler & Co., New York and London); sold November 1930 to Andrew W. Mellon, Pittsburgh and Washington, D.C.; deeded 30 March 1932 to The A.W. Mellon Educational and Charitable Trust, Pittsburgh; gift 1937 to NGA. According to Fiorenza Scalia and Cristina De Benedictis, Il Museo Bardini a Firenze, Milan, 1984: 121, the painting is registered under the year 1890, when, after having been sold by Stefano Bardini to Prince Johann II of Liechtenstein, it was presented to the export office of the Soprintendenza delle Belle Arti in Florence. Although the two authors erroneously report its location as the Johnson Collection in Philadelphia, there seems to be no doubt that the reference is to the NGA painting. Fern Rusk Shapley, Catalogue of the Italian Paintings, 2 vols., Washington, D.C., 1979: 1:258, gives c. 1925 as the date of the painting's passage from the Liechtenstein collection into that of Frank D. Stout; however, already in 1921 Wilhelm von Bode (Sandro Botticelli, Berlin, 1921: 106) reports the work as having been purchased by an American collector, and in 1924 the painting was exhibited in Chicago as part of the Stout Collection. See Bulletin of the Art Institute of Chicago, 18, no. 6 (September 1924): 76 (repro. ); 18, no. 7 (October 1924): 90. According to the Knoedler stock books, the painting was consigned by Mrs. Stout as Knoedler's number CA 267 (Getty Provenance Index). Loan Collection of Mr. and Mrs. Frank D. Stout, Art Institute of Chicago, 1924, no cat., illustrated in AIC Bulletin, September 1924: 76, as Young Man in Red Cap by Alessandro Botticelli. Bode, Wilhem von. Die Fürstlich Liechtenstein'sche Galerie in Wien. Vienna, 1896: repro., as by Botticelli. Preliminary Catalogue of Paintings and Sculpture. National Gallery of Art, Washington, 1941: 105, no. 20. Book of Illustrations. National Gallery of Art, Washington, 1942: 239, repro. 130. Paintings and Sculpture from the Mellon Collection. National Gallery of Art, Washington, 1949 (reprinted 1953 and 1958): 23, repro. Cairns, Huntington, and John Walker, eds., Great Paintings from the National Gallery of Art. New York, 1952: 32, color repro. The National Gallery of Art and Its Collections. Foreword by Perry B. Cott and notes by Otto Stelzer. National Gallery of Art, Washington (undated, 1960s): 23, repro. 20. Walker, John. National Gallery of Art, Washington, D.C. New York, 1963 (reprinted 1964 in French, German, and Spanish): 300, repro. Summary Catalogue of European Paintings and Sculpture. National Gallery of Art, Washington, 1965: 75. Cairns, Huntington, and John Walker, eds. A Pageant of Painting from the National Gallery of Art. 2 vols. New York, 1966: 1:54, color repro. European Paintings and Sculpture, Illustrations. National Gallery of Art, Washington, 1968: 66, repro. Shapley, Fern Rusk. Catalogue of the Italian Paintings. 2 vols. Washington, 1979: I:247-258, II:pl. 173. Watson, Ross. The National Gallery of Art, Washington. New York, 1979: 27, pl. 9. Walker, John. National Gallery of Art, Washington. Rev. ed. New York, 1984: 97, no. 58, color repro. European Paintings: An Illustrated Catalogue. National Gallery of Art, Washington, 1985: 228, repro. Kopper, Philip. America's National Gallery of Art: A Gift to the Nation. New York, 1991: 67-69, color repro. National Gallery of Art. National Gallery of Art, Washington. New York, 1992: 24, repro. Southgate, M. Therese. The Art of JAMA: One Hundred Covers and Essays from The Journal of the American Medical Association. St. Louis, 1997: 36-37, color repro. Boskovits, Miklós, David Alan Brown, et al. Italian Paintings of the Fifteenth Century. The Systematic Catalogue of the National Gallery of Art. Washington, 2003: 166-170, color repro., as by Botticelli. Hand, John Oliver. National Gallery of Art: Master Paintings from the Collection. Washington and New York, 2004: 19, no. 14, color repro. Schumacher, Andreas, et al. Botticelli: Likeness, Myth, Devotion. Exh. cat. Städel Museum, Frankfurt am Main, 2009: 196, fig. 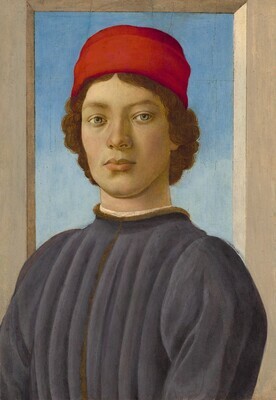 102, as Portrait of a Young Man against a Light Background by Sandro Botticelli.